The following books describe methods of provenance research for objects of various kinds, especially fine art objects and books. Vitalizing Memory: International Perspectives on Provenance Research. Washington, DC: American Association of Museums, 2005. Yeide, Nancy H. The AAM Guide to Provenance Research. Washington, DC. : American Association of Museums, 2001. Imitator of Constable, River View - a Clark painting with a fascinating provenance history! Between 1938 and 1945 this picture had a very complex history, reflected in a number of labels and marks on the back of the painting. The label “Oscar Bondy Wien No. 538” attached to the canvas probably reflects Bondy’s own numbering system. In May 1938, Bondy and his wife fled via Switzerland to the United States, where he died in 1944. The work appears as no. 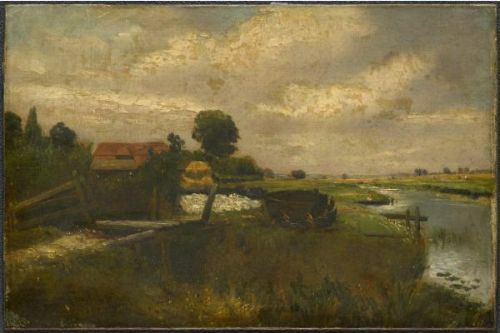 5, Flusslandschaft, haus m. rotem Dach (River Landscape, House with Red Roof) by Constable in a list of items (dated 3 April 1939) seized from Bondy’s home. See Lillie 2003, p. 222. The painting next went to Kremsmünster, Austria, where it was labeled on the stretcher with the number K 1687. It therefore appears to have been designated, along with much of the rest of Bondy’s collection, as going to Hitler’s planned Führermuseum in Linz, although it was not ultimately chosen for inclusion. It does not appear in the photo albums published in Schwarz 2004 or in the Deutsches Historisches Museum’s database of Linz objects (http://www.dhm.de/datenbank/linzdb/indexe.html). Three labels now removed from the painting reflect the property inventory number assigned by the Nazis, 1318 O.B. It appears to have been stored by the Nazis at Alt Aussee, then entered the Munich Central Collecting Point on 17 Oct. 1945 as no. 9883, to be restituted by American forces, and was turned over to Austria (under control of the U.S. Fifth Army) on 25 Apr. 1946. The number 111403, written on the stretcher in the same red pencil as “USFA” (U.S. Fifth Army), has not been identified. For information on the Munich Central Collecting Point, seehttp://www.dhm.de/datenbank/ccp/dhm_ccp.php?seite=9&lang=en. It was then returned to Mrs. Bondy in New York. Provenance: Oscar Bondy, Vienna and New York (by 1938–d. 1944, seized by Nazi forces, 1938, recovered by the United States Fine Arts Commission and restituted to Bondy’s widow); Elizabeth A. Bondy, his wife, by descent and restitution (1944–49, Bondy sale, Kende Galleries, New York, 3 Mar. 1949, no. 75, as A View on the Stour, Suffolk, by John Constable, sold to Manton); Sir Edwin A. G. Manton (1949–d. 2005); Diana Morton, his daughter, by descent (2005–7, given to the Clark); Sterling and Francine Clark Art Institute, 2007.